This post is sponsored by FED, however all opinions expressed are 100% my own. It’s not always easy to get your child to try new foods. Or stating eating that broccoli they decided one day they won’t touch anymore. 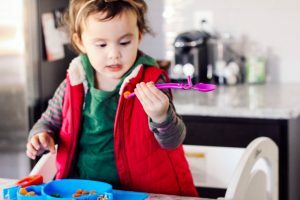 Most parents deal with their children going through a “picky” eating phase. It’s not fun, it’s very challenging and I honestly felt a little like a failure. When I say Izzy ate everything, I’m not joking. She ate fish, chicken, steak, potatoes in any way, all veggies.. everything guys! 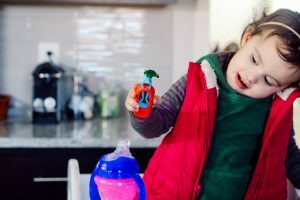 I stuck to it and kept eating a fun experience for Izzy through the picky times and it had paid off. Little licks of foods or chewing to try and spitting out… all victories in my book! She’s still “picky”, but it trying and liking new foods all the time. She turns 3 in March and this has been going on since before she turned 2. I have lots of tips for your guys but my number one tip would be to have fun with food. 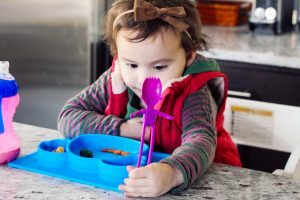 When Izzy has silly utensils or a cute plate it creates a positive feeling about mealtime and trying foods. This is why I really have loved our FED utensils. FED stands for Fun, Eating, Devices. They are exactly that! 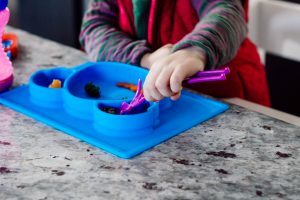 These tools encourage children to eat their food in a fun way. 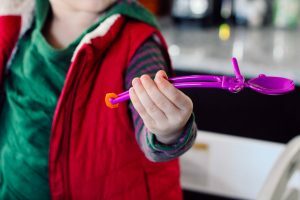 The sporkman pack is great for scooping and working on chopstick skills. The crabby grabby is a bit more challenging and I like that. 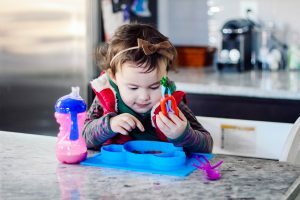 Izzy is able to work on fine motor skills while having fun eating. By having fun that means no forcing. I never force Izzy to eat anything, but I will push her to lick something with her “snake tongue”. Or we will see if something is soft or crunchy. She knows she can spit it out if she doesn’t love how it tastes. She has found that she likes foods she didn’t from this method. 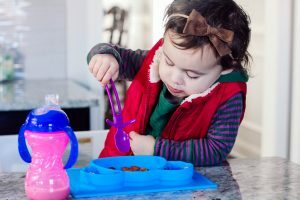 Using fun utensils is a great way to get the foods to her face. I also always give Izzy a small amount of what we are eating. So 1 tiny broken off piece of broccoli. If Izzy is already is starting to eat them, I’ll give her a few more to start. Give your child a SMALL amount of portions. 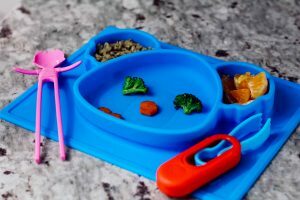 Large portions can be very overwhelming and make keep tour child from wanting to even try anything on their plate. With our food I always gave Izzy some things I knew she loved too. But again a small amount. Silly things like making faces with the food has really helped. Izzy will take bite of the mouth (all a sandwich), preferred food. I make a big deal and say, “OMG you ate the one of their teeth!” Then I say, “don’t eat that nose.” This is typically a non preferred food (a cooked carrot coin). Now Izzy LOVES cooked carrots! In this shot you can see I put quinoa/rice in one ear, oranges in another and carrots as the mouth. Izzy’s non preferred in this photo is broccoli. She has on occasion eaten it, so I keep introducing small bits to her lunch. This plate is from Nuby, they have a few other animal designs and colors. 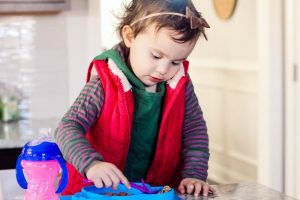 I want you guys to know, this is a slow process fo getting your child on board with new foods. Don’t get frustrated and just know, they will eat veggies and try new foods again. Have fun with eating guys! 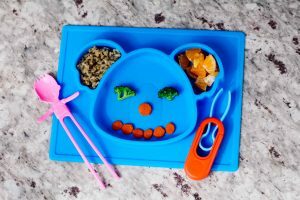 What a fun way to get children interested in food again! My kids would love these! 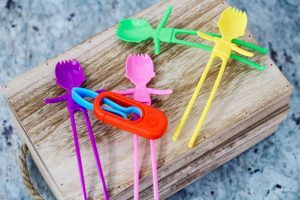 These are the coolest utensils ever!! Ari would LOVE them!! These are so cool, I need them for my boys! I will definitely be getting these for my youngest! So cool! This is adorable! 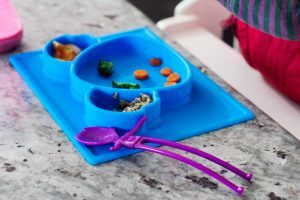 I love that they can learn how to use chopsticks too – that’s awesome! 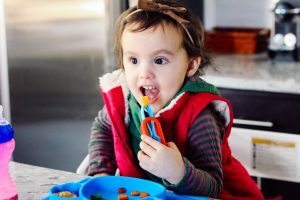 My little girl just started solids a few months ago, but these are great tips to keep in mind! I love the “don’t eat that nose!” trick! Those utensils are too cute! My daughter is super picky too… wondering if she would benefit from using these. you always have the best product recommendations!